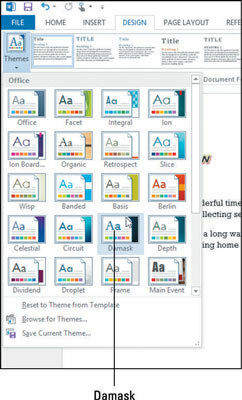 Themes enable you to dramatically change the look of a Word 2013 document quickly. They apply several types of preset formatting to text, including font, color, and object formatting. 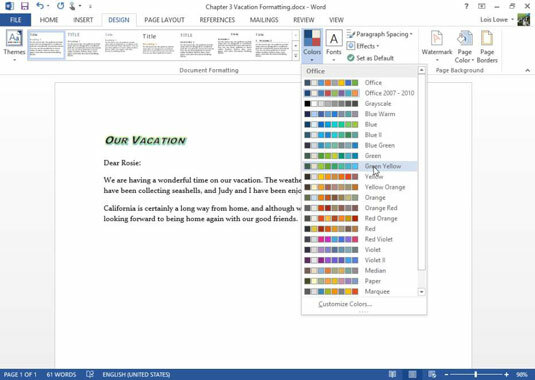 In a Word document that contains only text, you won’t notice the effect changes when you switch to a different theme, but the font and color changes will be apparent. A theme is a file that contains settings for fonts (heading and body), colors, and object formatting effects (such as 3-D effects for drawn shapes and SmartArt diagrams). Themes enable you to dramatically change the look of a document quickly. All the Office applications use the same set of themes, so themes can help you standardize the look of your work across multiple applications. For example, you could make the fonts and colors on a brochure you create in Word similar to a presentation you create in PowerPoint. You can also apply color themes, font themes, and/or effect themes separately. This ability is useful when none of the available themes exactly match what you want. 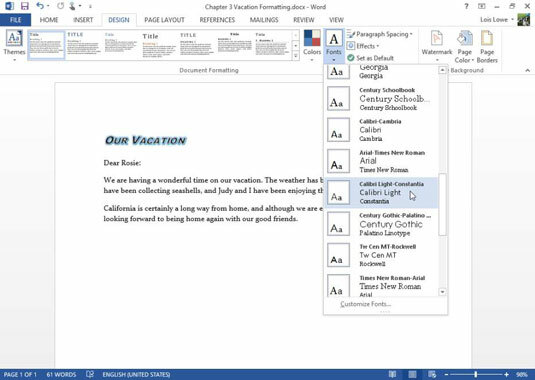 After you select the right combination of colors, fonts, and effects, you can save your choices as a new theme to use in other documents (including in Excel, PowerPoint, and Word). Themes affect only text that hasn’t had manual formatting applied that overrides the defaults. For example, if you’ve specified a certain font or font color for some text, that text doesn’t change when you change the theme. You can strip off manual formatting with the Clear All Formatting button on the Home tab. In a Word 2013 file, choose Design→Themes, and in the list of themes that appears, choose Damask. The colors and fonts in the document change to match the theme. Point the mouse at several other themes and see their effects in the text behind the open menu. Click the Fonts button, and in the list of available theme font sets that appears, choose Calibri Light-Constantia. The fonts in the document change. Click the Colors button, and in the list of available theme color sets that appears, choose Green Yellow. The color of the glow around the heading changes to green.